Close to 85,000 of children have died between April 2015 and October 2018. Approximately 85,000 children under the age of 5 have died in Yemen from severe hunger since April 2015, according to a new report from Save the Children. In a briefing in October, Mark Lowcock, the United Nations Under-Secretary-General for Humanitarian Affairs and emergency relief coordinator, said nearly 14 million people in Yemen -- or about half of the country’s population -- are facing pre-famine conditions. 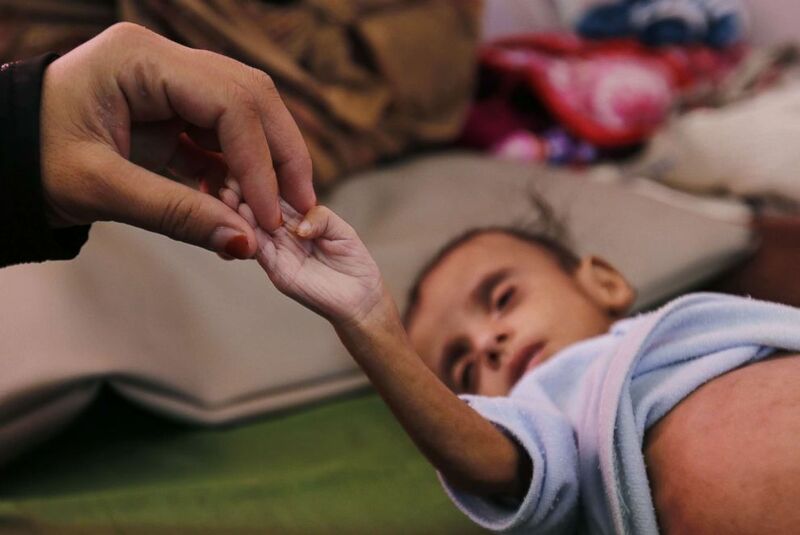 (Yahya Arhab/EPA via Shutterstock) A woman holds a hand of her malnourished child as he receives medical attention at a malnutrition treatment center in Sanaa, Yemen, Nov. 16, 2018. 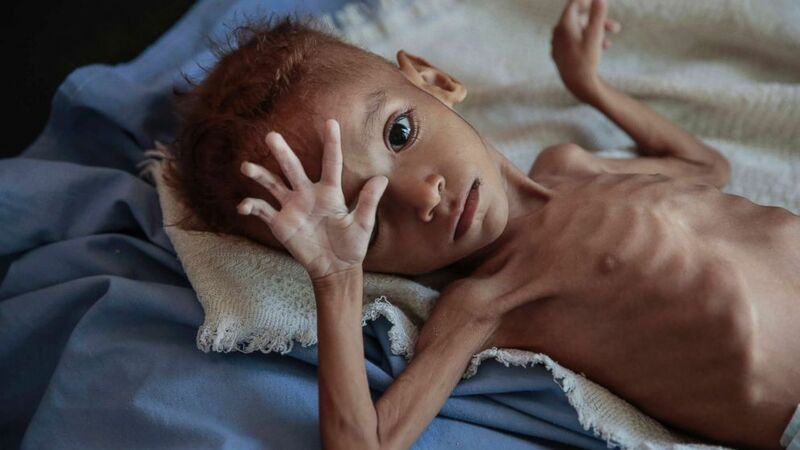 But Kristine Beckerle, a Yemen researcher for Human Right Watch’s Middle East and North Africa Division, said an official declaration of famine in Yemen is beside the point. “The fact of the matter is people are dying now. Kids are dying now. Millions of people are going hungry now, in a context where, if states wanted to, they could in fact address the situation, minimize civilian suffering and mitigate civilian harm,” Beckerle told ABC News. 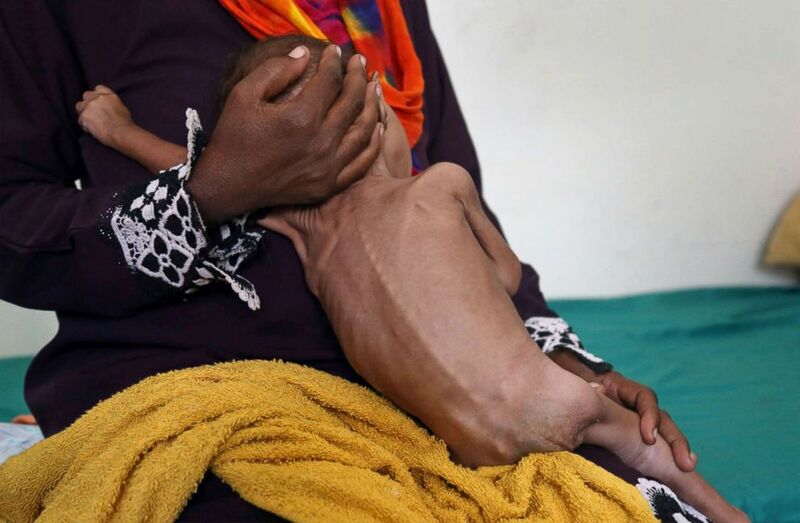 (Ahmad Al-Basha/AFP/Getty Images) A woman holds a child suffering from malnutrition at a treatment center in a hospital in Taez, Yemen, Nov. 21, 2018. Instead, the Trump administration released a statement on Tuesday siding with Saudi Arabia in the conflict, saying it will withdraw from Yemen as long as the Iranians agreed to leave. The statement also highlights the $110 billion sale of U.S. military equipment to Saudi Arabia, equipment that the country uses in the conflict in Yemen. Earlier this week, ABC News reported that Yemeni officials and Houthi rebels have agreed to attend peace talks in Sweden in an effort to end the civil war in the country. (Hani Mohammed/AP) A severely malnourished boy rests on a hospital bed at the Aslam Health Center, Hajjah, Yemen, Oct. 1, 2018. An estimated 85,000 children under age 5 may have died of hunger and disease since the outbreak of the civil war in 2015, an international aid group said Wednesday, Nov. 21, 2018. "These talks are the best chance of securing a resolution to the conflict," Marcus Skinner, senior policy adviser for International Rescue Committee, told ABC News. "The claim that there has been a pause in the fighting doesn't translate to what we see on the ground and the assault on the city reduces the chances the talks will succeed." Diplomatic pressure by key world leaders like the United States and the United Kingdom are needed to stop the violence and get all sides of the conflict to Sweden, he argued. Exact number of fatalities in Yemen have been difficult to report for humanitarian groups and officials on the ground, with many hospitals being targeted by rebel groups. “The war and violence need to stop for human suffering to stop,” Skinner said.